I had the great privilege to sail “Columbia” the first twelve meter to defend the America’s Cup in 1958. at the America’s Cup Jubilee. There were 38 twelve meters there. This was a celebration of the 150th anniversary of the America’s Cup. The idea of the Royal Yacht Squadron, from my prospective it exceeded all expectations. It was an endless parade of yachts each more beautiful and graceful the the next. 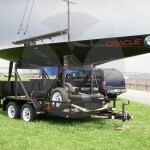 ORACLE TEAM USA, winner of the 34th America’s Cup, and Boeing [NYSE: BA] are collaborating to recycle 7,000 pounds (about 3,175 kilograms) of carbon fiber of USA-71, a yacht built for the America’s Cup campaign in 2003. The hull and mast of the racing yacht will be processed and repurposed, a first-of-its-kind effort for what will likely be the largest carbon structure ever recycled. ORACLE TEAM USA and Boeing, working with research partners, will utilize a technique developed to recycle composite materials from Boeing’s 787 Dreamliner, which is 50 percent composite by weight and 20 percent more fuel-efficient than similarly sized aircraft. Composite materials allow a lighter, simpler structure, which increases efficiency, and do not fatigue or corrode. In yachts, composite construction also provides the ability to develop a lighter vessel that is stronger and stiffer at the same time. Boeing and ORACLE TEAM USA will work with the University of Nottingham in the United Kingdom and MIT-RCF, a South Carolina company focused on repurposing carbon fiber components. USA-71’s hull will be cut into 4-foot sections and the mast will be chopped into manageable pieces before it is processed; about 75 percent of the recycled composites will come from the hull and the remaining 25 percent from the mast. Through these processes, Boeing and ORACLE TEAM USA expect to gather data about the mechanical properties, costs and time flows to recycle sailing-grade composite materials in comparison to aerospace-grade and automobile-grade composites. 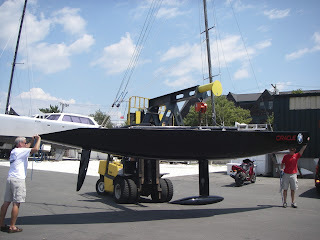 The companies have not determined the post-recycling use of the yacht’s carbon fiber, but potential end uses include consumer and industrial products. 27′ Goetz 1/3 Scale IACC Yachts (2). US$ 60,000. Located In Newport, Rhode Island, USA. 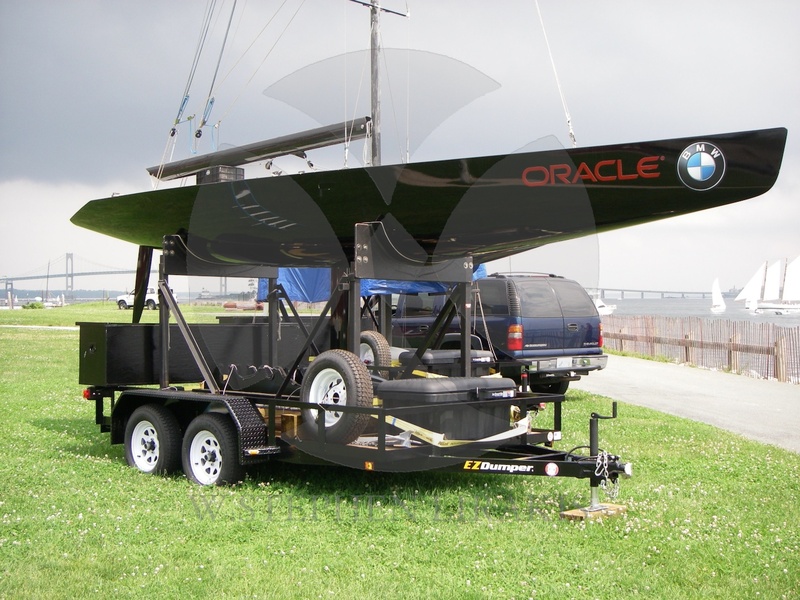 When preparing for the 2000 America’s cup in New Zealand, the BMW/Oracle syndicate was having trouble getting enough time in the wind tunnel to test sail shapes and the costs were escalating. They hit upon the idea of designing a building to 1/3 scale models for on the water testing. 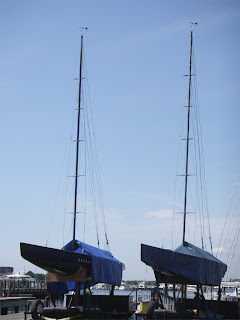 Set up to be sailed by two people, they have all the sophisticated sail and mast controls of the full size boats and the mast placement in the boat can be varied for and aft. Carbon fiber laminated hull and deck. Lead keel bulb with steel shank. 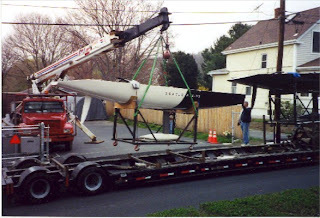 Carbon fiber rudder and tiller. Exterior of hull and keel painted black. Thanks to Harry Morgan at Sparkman & Stephens. Featured Brokerage27′ Goetz 1/3 Scale IACC Yachts (2). US$ 60,000. Located In Newport, Rhode Island, USA. 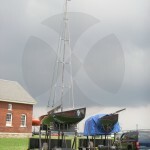 These two wonderful one-third scale America’s Cup boats are listed for sale with Harry Morgan at Sparkman & Stephens. Exact replicas of their big brothers,built entirely of carbon fiber, they move effortlessly through the water. 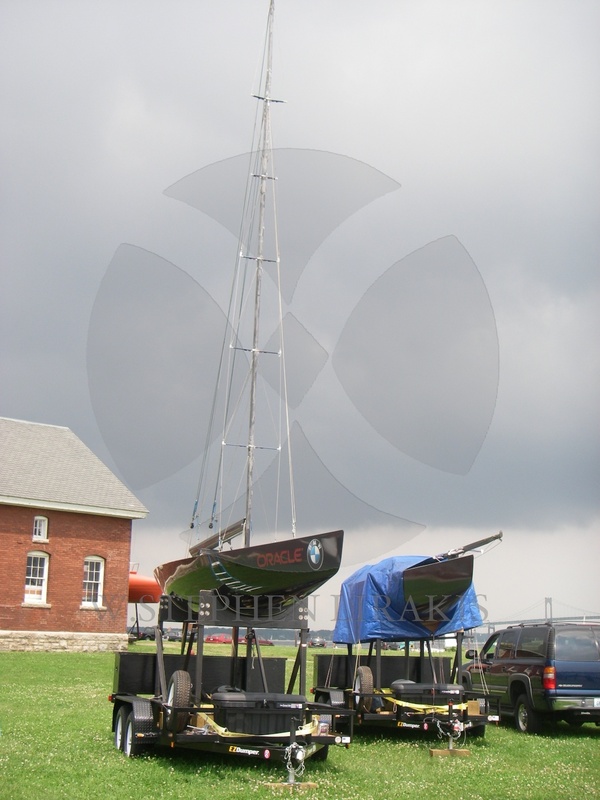 Included are three masts, 6 suits of sails (3dl) all rigging, ready to go. These historically significant boats are a joy to sail, elegant and powerful yet responsive. What do Bill Hubbard, Jimmy Gubelmann, Jack Cummiskey and Stephen Lirakis have in common beyond a love of sailing? Two very cool boats. These are exact one-third scale full sailing models of the IACC class boats that competed for the America’s cup. Where did they come from? You might notice the BMW/ORACLE logo on the bow. 27 feet long, 4 feet wide, and a draft of 5 feet. displacing 2050 pounds. 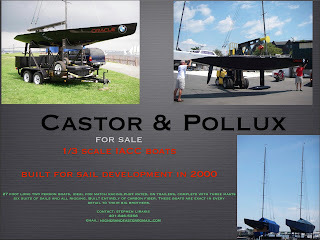 (1650 pounds are the lead package) All carbon fiber, with six suits of sails. awesome.